The weight is stated to be 15 tons 18 cwt 1 qr. 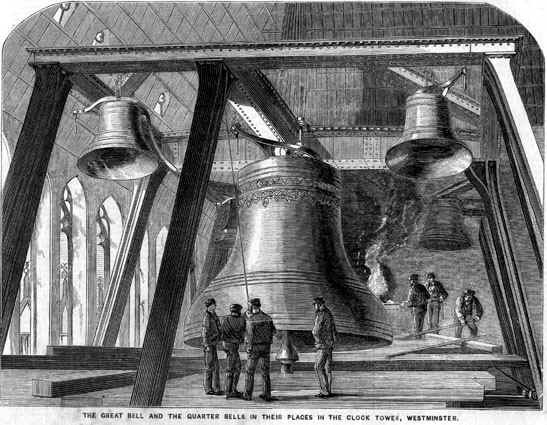 22lb., or 16 tons within a small fraction; which is nearly half as much again as the great bell of York Minster, more than twice that of Oxford; nearly three times as heavy as the large bells of Exeter, Lincoln, and St. Pauls, and exactly six times the weight of the great bell of Bow. The four quarter bells together will not weigh quite half as much. The thickness is 9 3/8 inches at the soundbow, where the hammer strikes, and 3 1/8 in the upper part, being very nearly 1-12th and 1-36th respectively of the diameter at the mouth, 9 ft. 5 in. The great bell was sent down from Norton to West Hartlepool by railway on Sunday, being too wide for any train meeting it to pass. The composition is 7 of tin to 22 of copper, melted twice over, as in speculum metal, to secure a perfect alloy. The metal is nearly as hard as spring steel, and much harder than is usual in modern bells, in which the proportion of tin is less than in the best old ones. This proportion was adopted after trying experimental bells of various proportions and the shape, which is fuller at the soundbow than usual, was determined in the same way. When the bell arrives at Westminster it is to be hung for trial at the foot of the clock tower, with a clapper of half-a-ton to be pulled by five or six men. It is finally to be hung in the open part of the spire of the tower, which was made for the purpose, in order that the sound may issue without obstruction. It is described as sounding as if it were struck with a wooden hammer, from its remarkable softness, although the hammer which has hitherto been used is of cast iron, and the bell still harder. 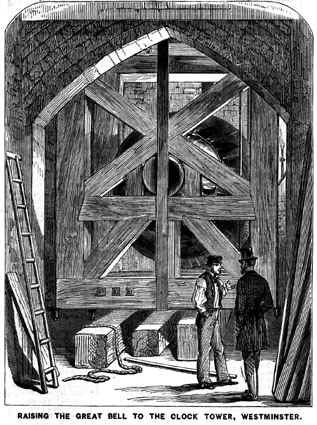 The quarter bells will now be proceeded with; the largest of them will be six feet in diameter, and will weigh about four tons, and is also to be cast at Norton, near Stockton-on-TeeS. Clock bells for the new Palace of Westminster - Breaking up "Big Ben"
This is the age of great wonders, more especially in arts and sciences. Almost every country in the world has had its Great Exhibition, and overgrown London has its big bore or tunnel, its big ship, and its big bell. But success is not always proportionate to size, and the great bell for the great clock at Westminster is a case in point. 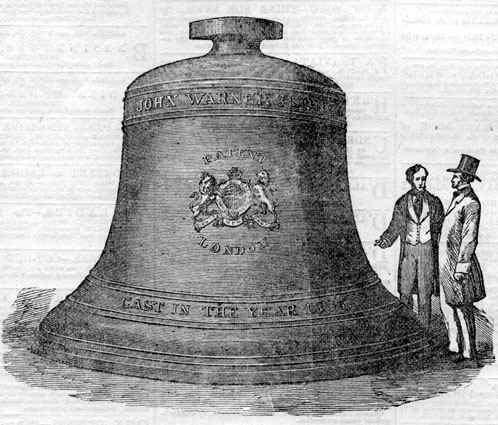 The bell having been cast at Norton, near Stockton-on-Tees, had to be conveyed by railway to West Hartlepool to be shipped for London. It was too wide for any train meeting it to pass, and of necessity, had the railway to itself. 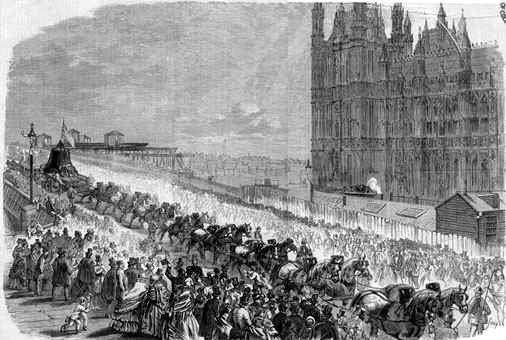 It reached Maudslays wharf in safety, and was then drawn upon a low truck, by sixteen horses, over Westminster-bridge and safely deposited at the foot of the clock-tower in Palace-yard. This took place some sixteen months ago. It was followed by the experiment with a hammer of half a ton weight, which fully brought out the sound. Up to this time all went merrily as a marriage bell; when the savans not being content to let well and bell alone, in repeating the sounding experiments, cracked Ben, though the metal was nine inches thick. Bells have the faculty of speaking, and Ben might have quoted the family motto of the then Lord President of the Council  Frangas, non flectes  thou mayest break, but not bend. There lay the giant sound, reminding one of the cracked bell in the mystical composition known as Hogarths Tailpiece. Next came the last scene in the brief history of the great bell, and poor Ben had to be broken to pieces on the spot where he was first deposited at the foot of that clock tower to which his admirers hoped he was to have given voice for centuries for come. This took place on Thursday, the 18th July. The process by which the enormous mass of metal was reduced to fragments may be told in a few words. Ben was simply lowered from the massive framework which supported him in the corner of Palace-yard, and laid upon his side on the ground. In this position the great weight of the head of the bell caused it to sink into the earth, so as to leave its mouth, instead of being completely vertical, slightly inclined upwards, yawning like an enormous cavern. From the framework above an ordinary rope and block were fastened and with them, but the aid of windlass, a ball of iron weighing 24 cwt was hoisted to a height of about thirty feet, and when the proper moment arrived suffered to fall with all its weight upon Ben. There was something lugubrious in the attendance of the Rev. Mr. Taylor and Mr. E. Beckett Denson, Q.C., who came in a kind of mourner-like capacity to see the last of the bell on which the latter gentleman has discoursed so minutely, to the great delight of the moments of the Royal Institution in Albermarle-street. The breaking-up (by the way, a few days before the break-up of the Ministry) was after the manner of pile-driving in the river hard by. The instant the heavy iron ball reached its appointed height the string was pulled, and down came the mass in the inside of Bens  sound bow, and, with a crazy bellow, two pieces, one of about a ton, and one of some 10 cwt. or 12 cwt., were knocked clean out of his side. After the first blow the work of destruction went on rapidly, piece after piece was broken out till scarcely anything by fragments remained of poor Ben, and even these were carried away as fast as possible to Messrs. Mears foundry in Whitechapel. 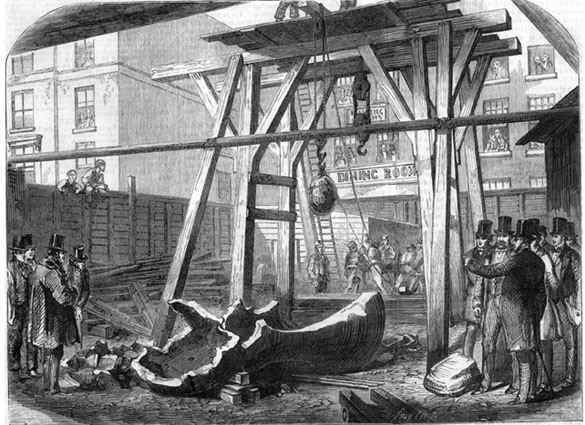 The recasting of the great Bell for the Clock Tower of the new Houses of Parliament took place at the bell-foundry of Messrs. Mears, Whitechapel-road on Saturday last. The old bell was begun to be broken on the 17th of February last, and the operation lasted nearly a week. 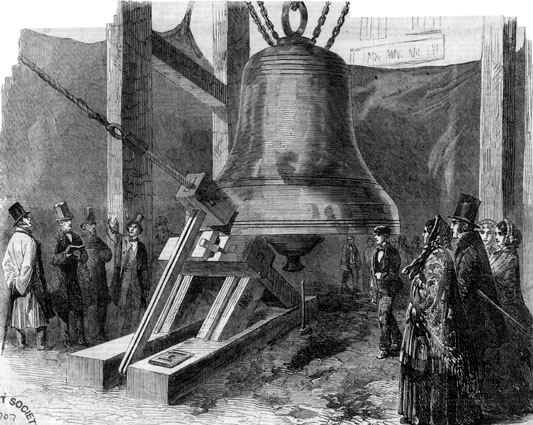 The pattern of the new bell was begun in November last, from a drawing given by Mr. Denison; and the making of the mould commenced on the 18th of December, and was continued without interruption till about three weeks ago, when it was finally put together and rammed up. The mould consists first of the core, which is built up of bricks, covered with clay, and formed to the shape of the inside of the bell, by means of a board, called the sweep or crook, travelling round a centre. When this is well dried, by a fire on the inside, what may be called a clay bell is made upon it, the outside of that being swept out by another crook in the same way. This also has to be thoroughly dried before proceeding to the next operation, which is the making of the cope, or outside mould. Of the bell. This is made of clay or loam, held together with iron bands, and fitted with hooks to lift it by when it is dry. When it is lifted it brings the clay bell with it, holding by means of the thin beads which may be seen round all large bells, and technically called wires. The clay bell is broken out of the cope which is then put down again over the core, and in this instance bolded down between a large iron plate under the core and a smaller one on the top of the cope. The pit was 13 feet deep, and, the extreme height of the bell being 7½ feet, there is considerable space left for a dead head, or pressure of metal, which is essential to produce sound casting at the top. After the cope is put on and bolded down, the pit is filled with sand and well rammed, and this operation occupied twenty-seven men four days. 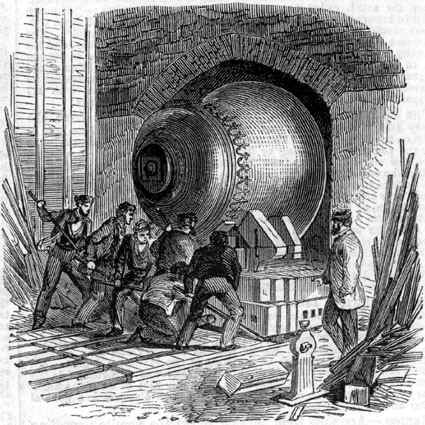 The metal was melted in three furnaces, holding together very nearly eighteen tons, of which nearly sixteen tons was the metal of the old bell, and the rest new metal, previously run into ingots in proportion of seven of in to twenty-two of copper, as in the former bell. The larger pieces of metal remained in the furnace about twenty hours, and the smaller ones about ten hours. Mr. Mears still uses only wood fuel, as the old founders did, which does not melt the metal so quickly as coal, but is supposed to be better in its action. 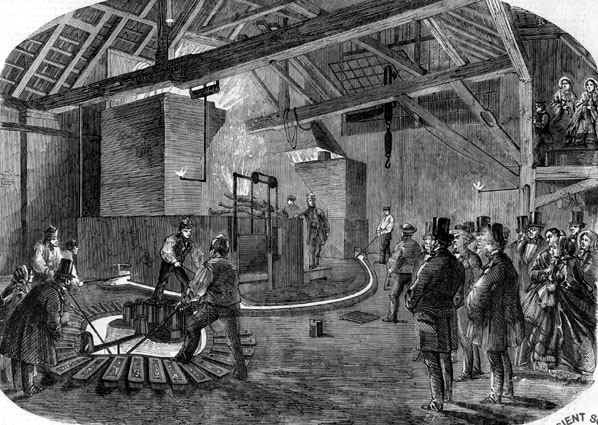 An operation was performed here for the first time in bell-founding viz., blowing hot air into the mould during the whole of the day before casting. This is now usually done in large castings of brass or gun metal, and Mr. Denison wished to have it done with the former bell, but Messrs. Warner thought it unnecessary. On this occasion it was made one of the conditions of the contract. As soon as the metal in the furnaces was pronounced hot enough, the hot air was cut off and the airhole filled up. 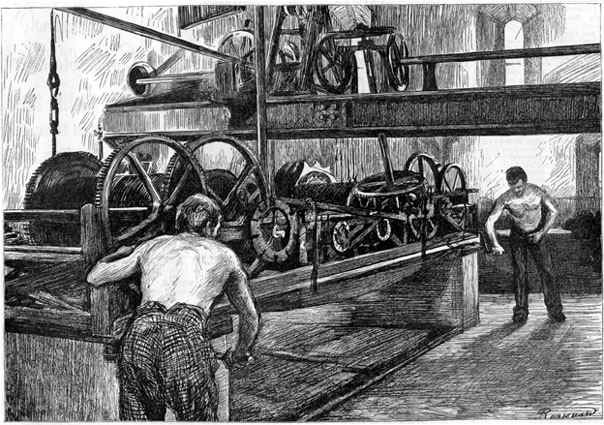 The fountains of metal were opened at twenty-seven minutes to eight p.m., and the mould was filled up in twenty minutes, the workmen regulating the supply as seen in the Engraving. Nothing can be known of the success of the operation for two or three weeks from the time of casting, as it will take a fortnight to cool. We shall give full particulars of the exact dimensions and weight of the bell hereafter. ARRIVAL OF THE NEW BELL "VICTORIA"
On the next page we give two Illustrations of this interesting event. Our small View shows the bell entering the arch, being propelled by levers upon a tramway. The larger one gives a sectional view of the mode of raising the bell. The labour of lifting the bell  the Royal Victoria, Big Ben, or whatever its name is to be  was brought to a successful termination on Thursday afternoon. Since the first turn of the windlass, which raised it from the ground on Wednesday morning, there was not a single moments intermission of work. The windlasses were constantly in motion, the crabs had no rest, and the bell was continually, though slowly, moving to its destined chamber, which is its first resting-place. It has been found that fresh girders must be erected for the purpose of bearing the weight of the bell before it is hung, and for this purpose some considerable delay will be necessary. The bell will be formally hung probably on Monday or Tuesday. Some particulars respecting the processes for moving the great bell are annexed. In giving some idea of the process of raising the great bell it is necessary to mention the shaft up which the bell ascended is in the centre of the Clock Tower, and is somewhat more than 11 feet 4 inches by 8 feet 2 inches in proportion. It extends from the ground to the clock-room upwards of 180 feet in an unbroken line. Up the angles of this shaft timbers called guides had been fixed, to ease the ascent of the cradle with its ponderous burden. One side of the shaft was fitted up with some twelve or fourteen gas-jets, to light the interior during the progress of the work. The bell, placed on its side, rested on a stout oak bottom, as will be seen in the diagram, the sides of the cradle being added during its sojourn under the lower part of the shaft. All being completed, and the centre of gravity found, the cradle was then raised by means of a fine new crab, made for the purpose, placed immediately over the aperture of the shaft. Eight men, four to each handle, then drew it up. As the drum of the crab revolved and drew up its burden, the chains which accumulated upon it was passed from the drum to a smaller crab behind, so as to prevent any possible jerk arising from the slipping of the links, and also to avoid accumulation of weight. The cradle had attached to its sides four friction-wheels, which played upon the guide-timbers  as seen in the diagram  to ease the ascent. The chain was made expressly for the work, and was tested link by link. It is nearly 1800 feet long. It was made at Newcastle, by Messrs Crawshaye, and tested under the superintendence of Mr. Thomas Quarm, the clerk of the works to the new Palace of Westminster, and Mr. James of Bradwall, Blackfriars. We believe we are right in saying that Mr. Quarm arranged the whole of the plan for the raising; and Mr. James has carried it out with his usual ability, aided by his able superintendent, Mr. Hart. Our large Illustration will explain the mode used for the ascent better than our description. 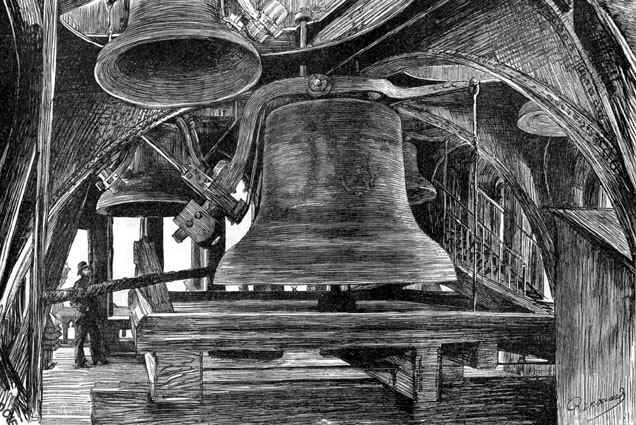 The bell is seen just entering the clock, where it rested the first time: it was then turned mouth downwards and drawn up to the bell chamber, seen in our Sketch. The work of hoisting has been an arduous and anxious affair for all engaged, and we hope their labours will be appreciated. The quarter bells of the Clock Tower were raised to their places last week, awaiting the ascent of their ponderous chief to commence active duties. The crab which was constructed to hoist the great bell gives 101lb. of power for every point of force applied to the handle. As each handle is turned by four men, and as each man applies a force of 15lb. without overstraining himself, an aggregate power of 12,000 lb. In round numbers is obtained at each turn of the handle. This force would seem tremendous; but then it takes ten revolutions of the handles to wind up one foot of the chain, and fifty revolutions to complete one complete round of the drum. Five hundred revolutions cover the latter with chain, when it has to be cleared, and the chain that has been hauled up transferred to another windlass. When the bell was raised from the ground to the clock room (a distance of 190 feet) it had to be restored to an upright position, fresh arrangements to be made, and a further haulage of forty feet accomplished to the bell-chamber. The exact dimensions of the bells are  great bell, 7 ft. 6 in. in height, 9 ft. diameter at the mouth weight, 13 tons 10 cwt. 3 qrs. 15 lb. Of the quarters: 1st quarter: weight, 1 ton 1 cwt. and 23 lb,; 2nd: 1 ton 5 cwt. 1 qr. 2 lb. ; 3rd: 1 ton 13 cwt. 2 qrs. 13 lb. ; 4th 4 tons 13 cwt. 2 qr. 13 lb. The notes of the bells are respectively  great bell, E sharp [sic]; 1st quarter, G; 2nd, f; 3rd, E (octave to great bell); 4th, B; and the reading of the chimes is, taking the notes as represented by the above figures  1st quarter: 1,2,3,4; half-hour: 3,1,2,4  3,2,1,3; 3rd quarter: 1,3,2,4  4,2,1,3  1,2,3,4; hour: 3,1,2,4  3,2,1,3  1,3,2,4  4,2,1,3, when the great bell will strike the hour. The latter will be struck on ordinary occasions with a hammer, but the clapper will be available for the announcement of great events, such as every loyal Englishman deprecates. It is expected that in calm weather the sound will be distinctly heard throughout a radius of five miles, measuring from the tower.